Spring has finally arrived and the back country is starting to show signs of its arrival. Here one of our most recognizable yearlings strikes a pose with its mom. We took the time yesterday to tour around looking for new life, after we had completed our chores at the handling facility. You know, poop patrol! 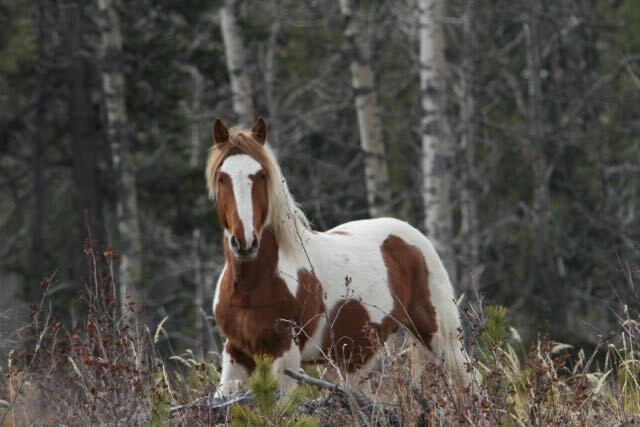 As we checked on the different herds we came across this beautiful stallion who let us know what he thought of us and our dogs. Blowing and snorting he made sure his mares were safe before hightailing it through the tall timber. There’s high jinx happening in horse country! 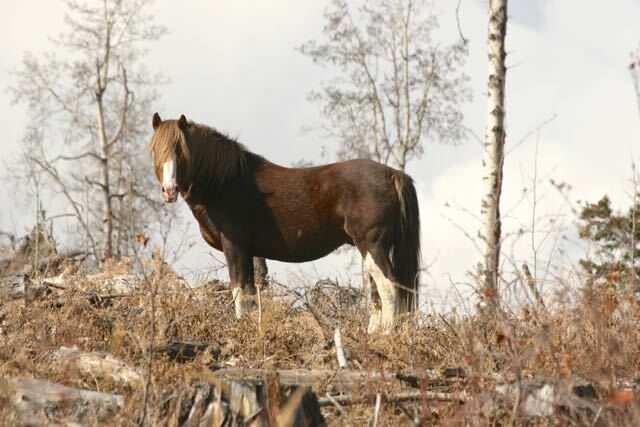 The patriarch “Socks” is missing two of his mares that we saw a month ago. 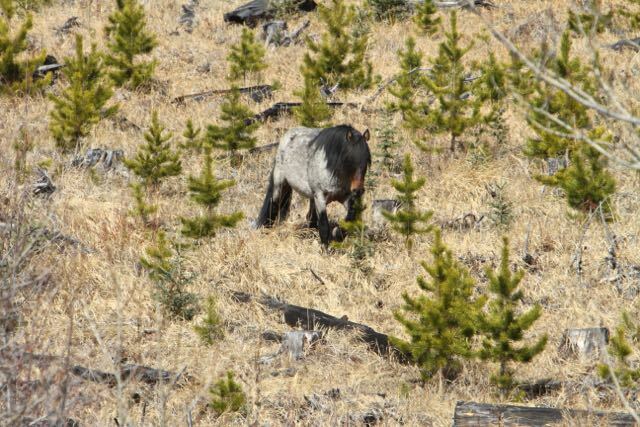 Now he somehow gained a roan mare showing that he still has it, despite his age! 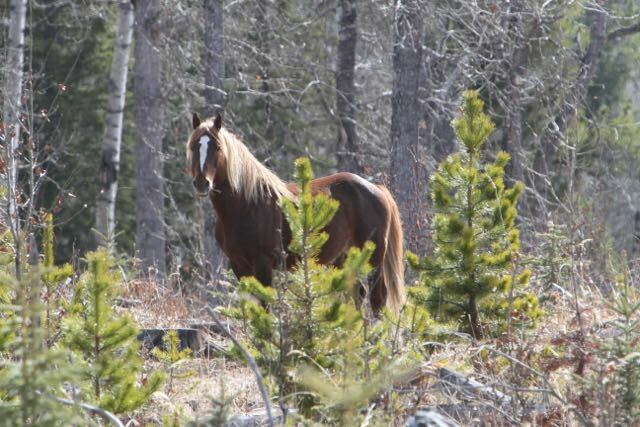 As we continued along we also came across one of our calendar boys, Dakota, whom we had not seen for sometime. This magnificent boy was moving down the hill to join his family who were feeding on the new grass coming up alongside a running stream. As we continued to see if any new foals were on the ground, we came across Socks Jr. looking stunning in the warm spring sunshine. 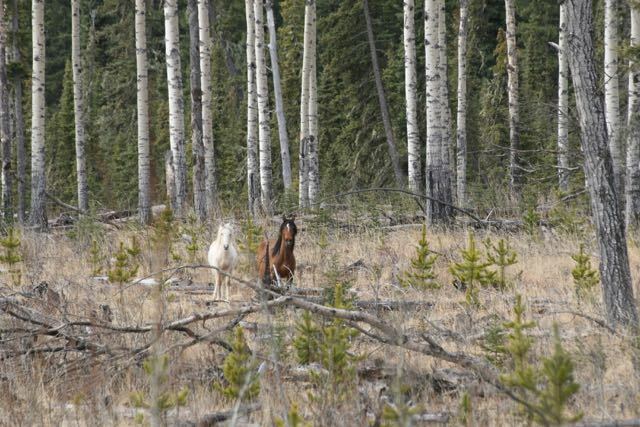 As we watched we suddenly saw one of his mares and something very small beside her – a very new foal. How exciting! As is typical with the wildies, they are so protective of their newborns, she allowed us only a short glimpse before she led the little one off. It amazes us to watch these newborns’ ability to be up and travelling through the deadfall beside their moms. 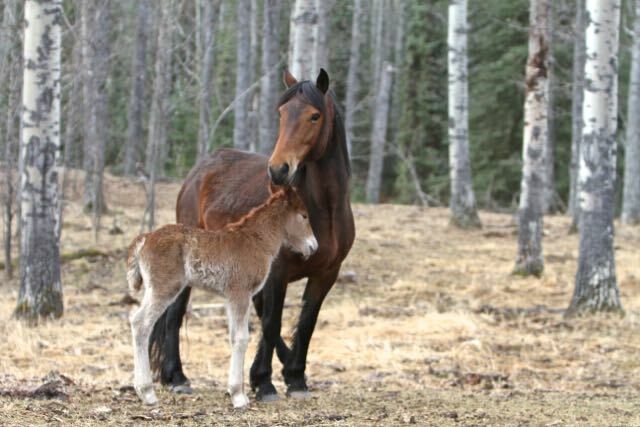 After arriving at the WHOAS facility, we found that one of the resident herd mares had given birth to this little filly. She is such a good and protective mom. 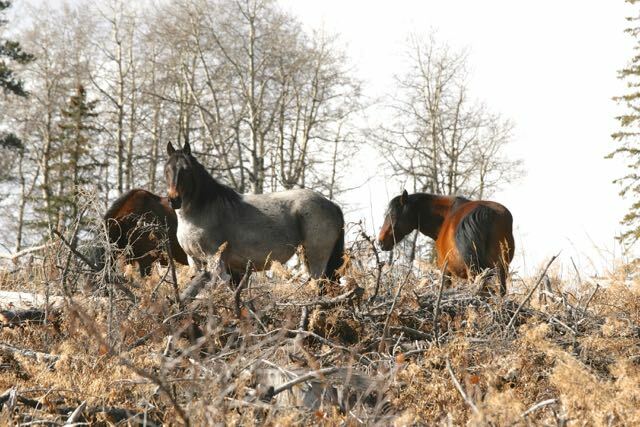 WHOAS has applied the contraceptive vaccine to all the mares belonging to the herd stallion, Portero. You may be wondering why she produced a foal this year. Last year she was the first one to foal in the early spring. We were waiting til after the foaling to administer the vaccine to her. However, she was impregnated by Portero before receiving the first dose. She now has been boosted which will give her a three-year pregnancy break. This truly shows that the vaccine is not harmful to the mares and they can produce healthy foals. 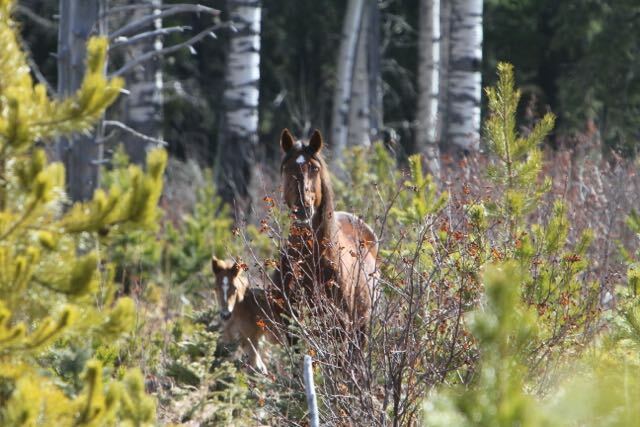 Watch the Gallery updates for new pictures of the wild horse foals we come across. 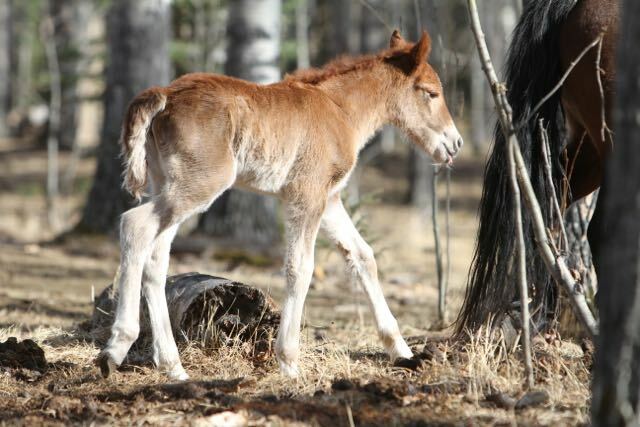 We will also pick one of the foals that children can enter a contest to name the foal. All entries will receive a 4 x 6 picture and the winner will receive a 11 x 14 matted print of the foal that they named. Watch for the start of this contest appearing soon on our website. Great photos and inspiring narrative. As usual, very well done.